Color, color and more color — that’s a sure-fire way to draw attention to the signage in front of your Northeast Ohio commercial property. Flowerbeds are a typical go-to for landscapers looking to draw the eye to an entryway, and there’s good reason why. Color makes us happy. We notice vibrant flowers, especially when the surroundings are mostly pavement. We agree that color is the way to go for capturing second looks from passers-by, but it’s not the only way to gain an audience. Color’s great, but if it only lasts for a few months, what will you do for the rest of the year to spruce up landscaping that surrounds signage? We always tell clients the top priority when planning landscaping near their business or retail signage is to differentiate your commercial property from the rest of the lot. Ultimately, you’re competing for people’s attention — just a glimpse of it. Here are five commercial landscaping ideas — beyond colorful flowers — that can effectively increase outdoor sign visibility. First, consider the size of plantings that are installed by your business or retail signage. We know you’re looking for big impact and those young shrubs might seem too wimpy at first, but we promise they will grow. If you plant shrubs and trees too close together, the result is a crowded, messy looking space that requires lots of maintenance. So choose right-sized plants from the get-go and think long-term. The other planting point to consider is timing. When will the flowering shrubs bloom? When will those perennials pop? You don’t want signage landscaping that pulls out all the stops in spring and looks drab by summer. Choose plants with a variety of bloom times to add interest throughout the seasons. Depending on the grade of your commercial property, the sign could need a lift so people can see it better. We’re not talking about stilts. Rather, building up the landscaped area where the sign is placed will improve its visibility. Some strategies for accomplishing this include installing retaining walls that can create a shelf of land on which a sign can be placed. Planters may be built into a wall, or box planters brimming with colorful flowers can serve as a sign booster. Walls, either formal or informal, will extend the sight line of the signage area and establish a dramatic backdrop. What does the landscaping surrounding your signage look like at night? Chances are, people will not be able to read the sign unless you use landscape lighting, such as low-voltage LED fixtures. Opt for spotlights that illuminate the sign and perhaps some accent lighting to show off surrounding plants or structures (walls). Before you install landscape lighting for signage, check local city ordinances for allowances. Some municipalities in Northeast Ohio have restrictions concerning how signs can be illuminated. We find that landscape lighting is especially helpful in cities that do not allow actual light-up signs. You can still shine a light on your signage while adhering to code. Water features will draw attention to properties that may not have space for grading (creating slopes for signage). 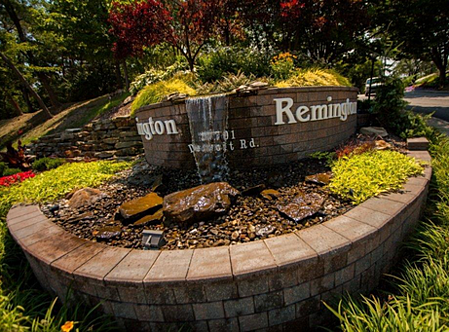 Water features become a focal point on a property — they can be incorporated into signage landscaping or located in another prominent area of the landscape, such as front and center. Sandstone and other natural stone — locally harvested, in particular — can add depth and visual interest to the landscaping surrounding your property’s signage. Rock outcroppings can be formed to look as if they’ve always been a part of the property, offering a more casual appearance. You might choose some “statement rocks” that are boulder-sized and can almost act as artwork because of the character they add to an outcropping. 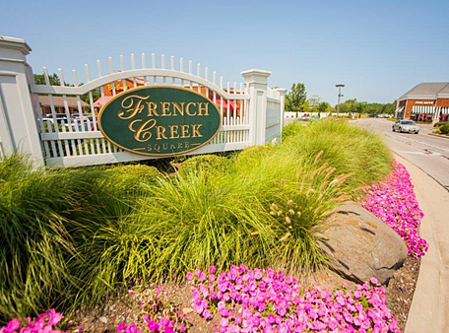 Tuck in colorful plantings, and use the outcropping as a platform for signage. 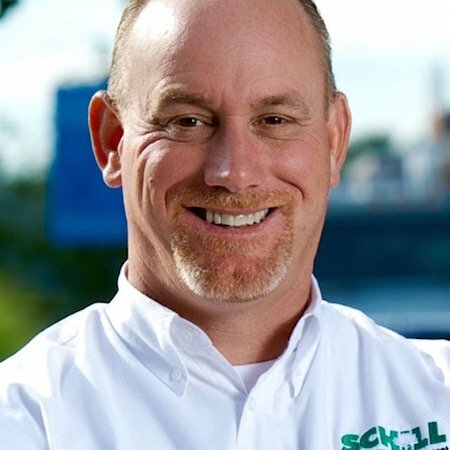 There are a number of commercial landscaping and hardscaping strategies that can draw attention to signage on your Northeast Ohio retail or business property, from layering plants to building walls of natural stone, and adding low-voltage LED lighting. 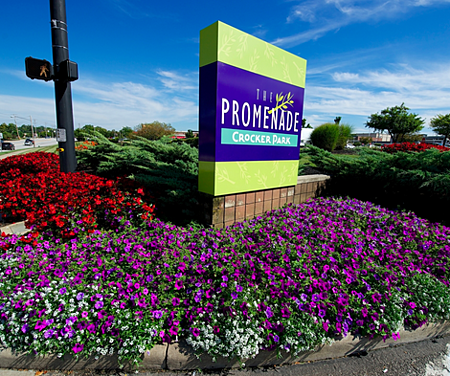 Let’s talk more about ways that professional landscaping can enhance your property’s signage. Call us any time at 440.327.3030, or fill out this simple contact form and we’ll get in touch with you. No matter how you accent the signage, ongoing landscape maintenance is critical for preserving the integrity of your commercial space.